Built in 1864, as St. Paul's Railway Bridge, these columns formed the support for the London, Chatham and Dover Railway, that once travelled across the River Thames from St. Paul's Station. The station went into decline after 1924, when more services began to use Waterloo Station. When St. Paul's Station changed its name to Blackfriars, the name of the bridge was changed, too. With a lack of trains, using the bridge, it became too weak to support the modern trains and was demolished, in 1985. Blackfriars Railway Bridge was completed in 1886 and is made with wrought iron arches, between brick supports. 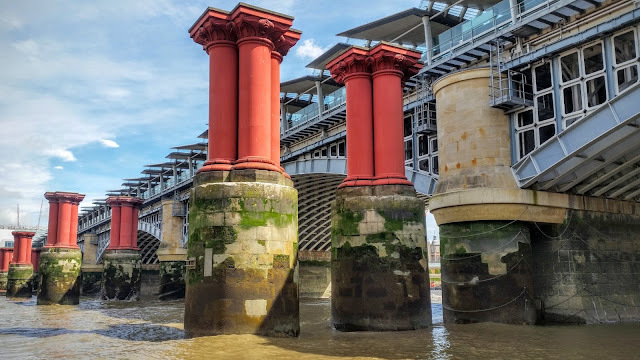 When it was decided to extend the platforms at Blackfriars Station, across the River Thames, some of the original supports of the 1864 bridge were incorporated into the widening of the bridge. Blackfriars Railway Bridge is the longest solar powered bridge, of which there are three, in the world.